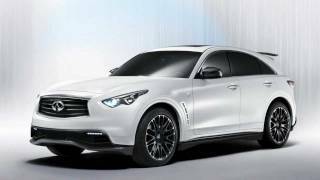 The perfect high-performance Infiniti Crossover - designed by, and built for, Formula One World Champion Sebastian Vettel - will make its debut in concept form at the 64th International Motor Show in Frankfurt on Tuesday 13 September. The Red Bull Racing driver and Infiniti Global Brand Ambassador will unveil "his" car at 14.15 hours. The first-ever Vettel-badged road car, the FX Sebastian Vettel version is the lightest, fastest and most aerodynamic FX yet, reflecting the World Champion's desire for a 300km/h Crossover that he can drive on his home country's derestricted Autobahn. Based on the already fast and sporting V8-powered FX50S Premium, the FX Sebastian Vettel version features changes to engine, suspension and body, with key aerodynamic enhancements implemented with input from Red Bull Racing. The one-off model also gains an interior personalised to Sebastian Vettel's taste, taking the brand hallmarks of exclusiveness and individuality to new heights. 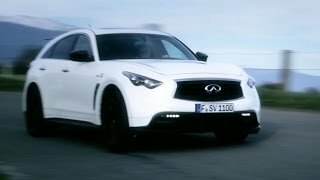 ROLLE, Switzerland (13 September 2011) – Just six months after the idea first surfaced, the Infiniti FX designed for reigning Formula One World Champion Sebastian Vettel is unveiled today at the Frankfurt International Motor Show. What began as a chat between the Red Bull Racing driver and Infiniti’s Chief Creative Officer, Shiro Nakamura, at the Geneva Show in March is revealed, in concept form, as Infiniti’s fastest car yet and, probably, the most exclusive crossover ever made. With its sophisticated technology, lightweight components and features such as Rear Active Steering for maximum agility, the V8 FX50S Premium – Infiniti’s flagship as well as its best-selling model in some markets – provides the ideal starting point for the FX Sebastian Vettel version. Changes including increased power, lower weight, derestricted top speed, longer gearing, increased downforce and lowered and stiffer suspension turn what is already a sports car among crossovers into a crossover supercar – the 300km/h reality of the World Champion’s vision. “I drive a lot in Germany on motorways that have no speed limits and have enjoyed my FX around the Nürburgring Nordschleife. Driving at high speed where safe and legal is part of my life. As well as a higher top speed I wanted even better stability in my FX, and that meant work on the aerodynamics. It is a tribute to the excellence of the standard FX that achieving all my targets required so few changes. As Sebastian says, the first priority for his ultimate FX was to give it more performance. However, whether on the racetrack or the road, speed is just one part of the mix that goes to make a world-beater. All the car’s systems, and in particular the aerodynamics, must be up to the task. In the FX Sebastian Vettel version they are. The car’s revised aerodynamics profile is the result of changes made by Infiniti designers and engineers after meetings involving Sebastian and Red Bull Racing personnel. A Red Bull Racing RB7 was even shipped to Japan to provide real life inspiration for the team bringing the World Champion’s road car dream to life. Riding 20mm lower than standard and featuring a more aerodynamic, as well as more distinctive, Essence-inspired grille, the most obvious change is the addition of a carbon rear wing. Tests show that it delivers everything that its looks promise – and Sebastian sought – in terms of increased downforce, and stability, at the 300km/h speeds of which the FX Sebastian Vettel version is capable. As well as a 30 per cent improvement in the coefficient of lift (Cl), the special FX boasts a 5 per cent lower coefficient of drag (Cd). Boosting downforce while simultaneously cutting drag is one of the concept’s major claims to fame. Even the door mirror housings have been shaped to increase downforce. Carbon is used for the splitter, sills, front grille, mirror covers and rear diffuser, trimming the weight of what is already one of the lighter SUVs in its size class. Design of the splitter and diffuser is inspired by the F1 car, as is the central rear fog light – just like an F1 car’s rain light. The wheels are 21-inch black multispoke alloys with silver rims, designed exclusively for this car; they don’t just look the part but also save weight over the standard 21-inch FX50 wheel. At 2049kg, the FX Sebastian Vettel version weighs 46kg less than a standard FX50S Premium. Lower and even more distinctive with new LED daytime running lights set just below the front bumper section, the concept FX exudes dynamic power. The new look enhances the sports car-like proportions and makes the flowing profile even more seductive. Dark smoke lights back and front complete the look – along with Vettel logos on both sides and at the rear. “We are always keen to listen to what our customers have to say about our cars, whoever they are. Equally we are always keen to show how individual our cars are, and how personalization can subtly alter their character. Making the perfect FX for Sebastian was the ideal demonstration of this. With an already potent 5.0-litre V8 under the bonnet, relatively little needed to be done to enable the world’s most special FX to hit Sebastian Vettel’s maximum speed target of 300km/h. 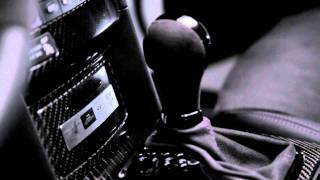 The first job was to free the car of its speed limiter which electronically restricts all other FXs to 250km/h. Even in standard form, with the VVEL V8 producing 390PS at 6500rpm, the car has plenty of performance beyond its artificial top speed, but even so more power had to be found to deliver 300km/h. No radical engine reworking was necessary to gain the extra 30PS that takes the FX Vettel concept’s power output to 420PS. A new exhaust system liberates some of the extra horsepower while a reprogrammed engine ECU takes care of the rest, with no discernible difference to the V8’s response or efficiency. And it sounds better than ever. In addition to the extra power is a longer final drive ratio to deliver 300km/h Autobahn speed without any detrimental effects on refinement. The longer overall gearing means the car is not as quick off the line as it could be – but at 5.6 seconds for 0-100km/h, two tenths of a second ahead of the standard car, no one is complaining. Least of all Sebastian Vettel. Stiffer springs and re-rated dampers take the FX50’s already highly focused sports chassis into a new area of precision control for the smooth-surface, high-speed driving for which the car exists. Essentially, however, making an FX to the World Champion’s specification required no major changes. Like any FX in sporting S guise, the concept features dual-flow path (DFP) dampers with continuous damping control (CDC); the same wishbone front/multilink rear suspension, much of it constructed out of aluminium; opposed 4-piston (front), 2-piston (rear) calipers for the 355/350mm brake discs; and vehicle-speed variable rack and pinion steering. Rear Active Steering, an important ingredient in any FX S’s blend of agility with stability, plays a key role in ensuring handling fulfils the World Champion’s requirements for a road car. 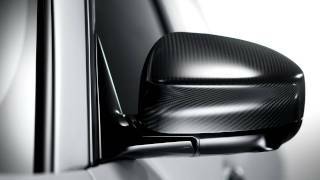 The bespoke carbon fibre exterior detailing is echoed in the FX’s cabin by tailored panels of black carbon – real, not appliqué – on the doors and centre console. Highlights that would normally be silver chrome are treated to a special black chrome finish, while in true F1 style, Alcantara is used on the steering wheel and gearshift paddles. Special seats, with extra support, are covered in black quilted suede cloth finished with purple stitching and special “SV” logos. The material also features on the pillars, roof lining and sun visors. A metal plate on the centre console featuring the World Champion’s signature provides the unique finishing touch. The luxury fittings, comprehensive features including Connectiviti+, one of the car world’s most complete and easily understood infotainment systems, and the FX’s award-winning range of safety technologies are all included. As standard of course. 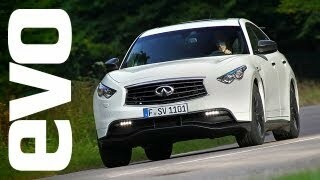 Infiniti believes that no one should be forced to pay for expensive extras. Not even World Champions.